Hackers have created a sub $200 Linux-based tablet device, all thanks to a little tinkering with an Internet Media Display. 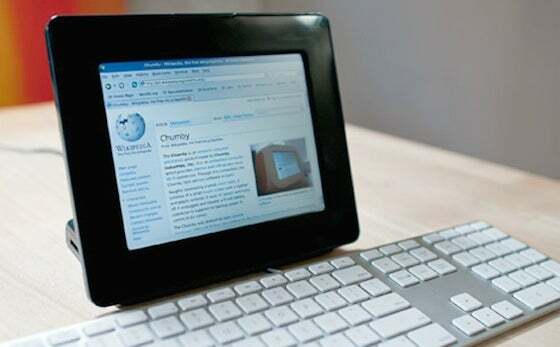 The device used to create this basic tablet was the Insignia Infocast — a simple $170 Chumby-powered Linux media device that was originally designed to share pictures and display information from the Web. Out of the box the 8-inch Insignia Infocast houses an 800MHz processor, 128MB of DDR2 memory, 2GB of storage, and an LCD touchscreen. It also packs in two USB ports and built in Wi-Fi. But hackers have discovered that, despite the device's limited capabilities out-of-the-box, it can do far more than just run the closed environment offered by the default Chumby operating system (OS). A recent mod shows how hackers are tweaking the fairly inexpensive tablet to run a WebKit browser, making it much more usable for general Web surfing. The mod also lets you use an external keyboard with the Infocast. Performing the hack is apparently a fairly easy process. According to the Bunnie Studios blog--home of Chumby co-founder Bunnie Huang--some modders are working on getting Google's Android OS playing nicely on the touch enabled device. One things for sure, this is no iPad or Galaxy Tab, especially considering the Insignia Infocast has no built-in battery, but for the comparitively low cost of entry it could well be a viable yet incredibly basic option for some.